Treat your skin to beautiful, handcrafted soaps made from the finest olive oil, coconut oil, vegetable oils and healing shea butter, with fragrant herbs and the best quality essential oils - nothing else added--no chemicals or animals products used! 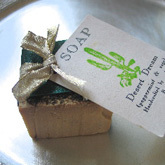 Every soap is exquisitely wrapped in organza ribbon and adorned with a colorful tag and descriptive story on the reverse side. Looks pretty, but excellent soaps for daily use! Lovely! 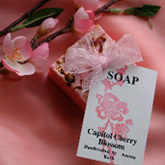 Our signature soap and the perfect souvenir from the Nation’s Capitol! Lively blend of spring flowers, great bath soap. Good for all skin types. Bonjour! 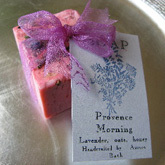 Wake up your senses to the most fragrant French Lavender oats and honey bar. Very relaxing and balancing for all skin types. 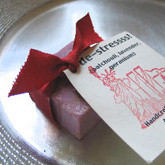 Kick stress in the caboose with this potent blend of patchouli, lavender, geranium and citrus oils. Excellent for all skin types. A spicy, sultry combination of French lavender and cinnamon leaf oil. 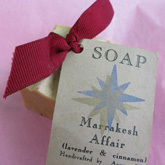 Great anti-inflammatory blend, making this a perfect shaving soap, men and women both love it! Dry to normal skin. Wow! 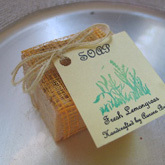 A fantastically potent lemongrass to invigorate and waken the senses. Good for normal to oily skin. Welcome to the Italian Garden of my ancestors! 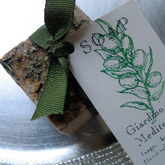 Rosemary, sage and basil and bay; invigorating and deep cleansing. Great kitchen hand soap with added cornmeal for scrubbing skin clean. Good for normal to oily skin. A wake-you-up mix of peppermint and sage oils, with ground herbs added for an invigorating treat! Great for normal to oily skin types.